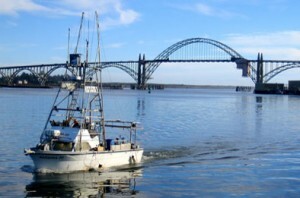 Today, Newport is considered to be the anchor of the Central Oregon Coast. 8,000 residents call Newport home full time — and an equal number of visitors are here throughout the year. Newport has a reputation as “the friendliest” among coastal cities. Newport is home to the Oregon Coast Aquarium, Oregon State University’s Hatfield Marine Science Center and most recently it has been designated as the Pacific Home Port for the National Oceanic and Atmospheric Agency. Commercial fishing and fish processing has been a mainstay of the local economy almost from the beginning. This includes fish of many species, Dungeness crab and shrimp. Timber exporting was a main player for many years as Yaquina Bay is one of the best deep water ports on the Pacific Coast. Learn more about the history of Newport. Newport is the center of arts and music on the coast with something to please every interest. Our area is also outstanding for its natural features and outdoor activities.